Our easel is becoming the hub of writing, drawing and mark making in our house. Located in the kitchen the kids can’t miss it and stocked with interesting pens and pencils, it’s just so tempting to pick one up and have a go? Sometimes a blank canvass can be off putting, especially for reluctant writers, so I’ve been setting up invitations to write, which the children have been finding irresistible. This week we’ve been writing and drawing our own comic strips. 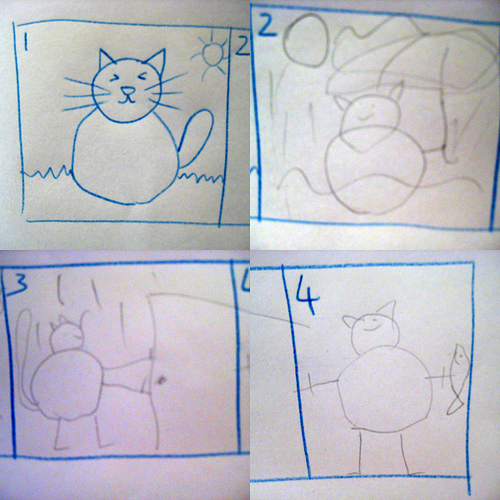 To get the children started I drew out a very basic comic strip – just four boxes, with a character in the first one to give the spark of an idea. Hey presto! The next morning our little cat was off on an adventure, battling hard times and pouring rain, through a magic doorway to a happy fishy ending. The comic strip layout helps the children think about a story format, with a start ,middle and end. Using pictures gets children to pick up a pencil and join in, even if they think writing is too hard, and includes even very young children. Having them tell the story to you and talk through their pictures builds in lots of language practise. And if you want to include more written story, you can add speech bubbles to each frame for the children to incorporate in their tale. Would be great to celebrate Charlie Brown’s bday on October 2. 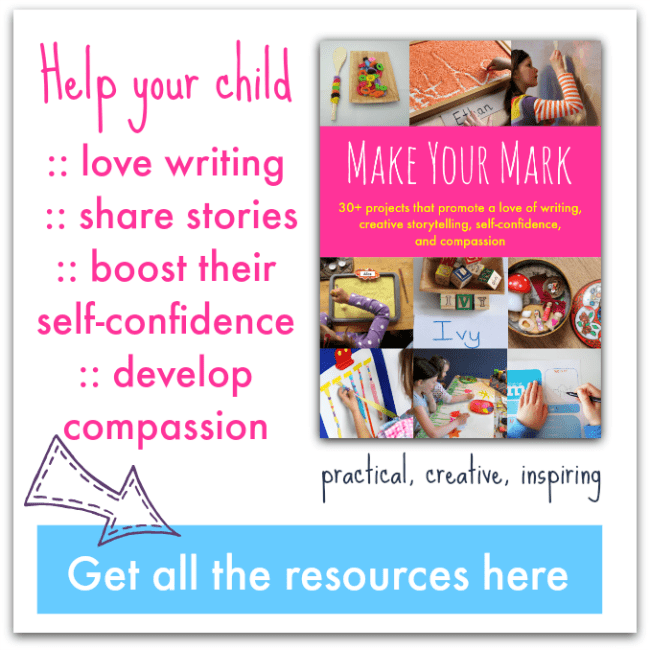 Great idea, Cathy for enhancing imagination, visualizing and storytelling. I must do this with my daughter. Great idea Cathy! I love the speech bubbles! That`s a good idea! We should give it a try..
mermaid – yes please, if she makes one we’d love to see a picture. This is a great idea. Pinning it for later! Came over from Link & Learn. how fun! I did comic strips w/my 2nd graders all the time but have never done it at home with my girls. To be honest I hadn’t thought of it at all. It would be fun to see what they come up with. Hope to see you share on the Sunday Showcase. Thanks Pam. I always love how each child makes an idea their own. This is a great idea. I’m going to try it this week with my son. It’s such a nice gentle way to get children to focus on beginning, middle and end. My son could really use this. This is such a great idea. My son did this last year in his kindergarten class with their “big buddies”, so the younger kids got to help in the creation process, while the big kids did the writing. He was so excited, he came home and did one of his own. 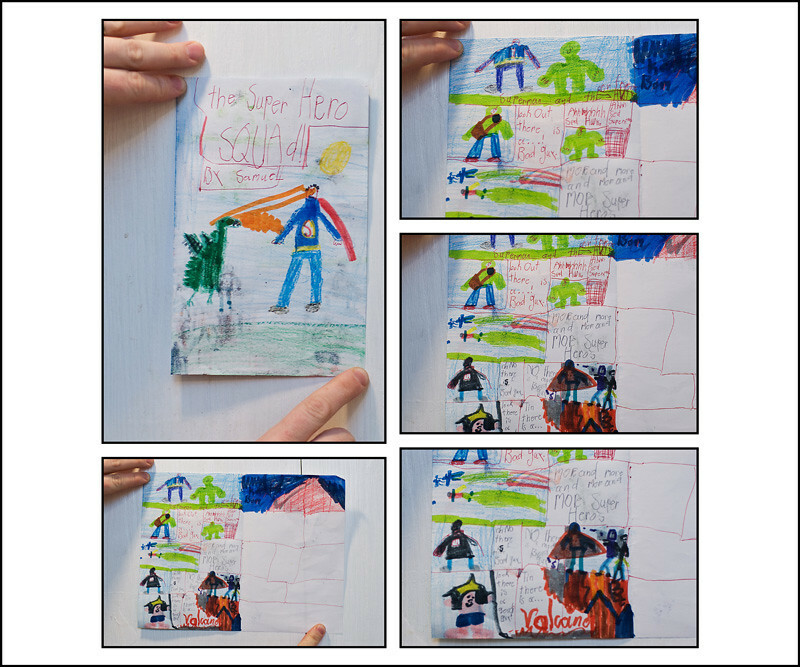 Writing and illustrating his own comics is now one of his favorite past times!